Paulo Vitor Damo Da Rosa added Ashiok, Nightmare Weaver to the main deck of his Grand Prix Sao Paulo-winning Esper Dragons list. 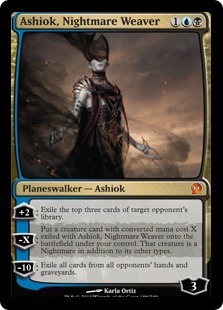 What are the implications of running Ashiok, Nightmare Weaver main deck? What decks does this acknowledge respect for? What got cut to make room? Ultimate Price is no longer “that good” “in the dark” in Standard. Face down creatures have no color, while legendary Dragonlords have too many colors to be hit by Ultimate Price. 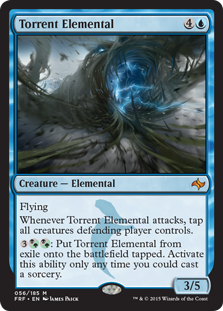 Just putting Torrent Elemental somewhere in your seventy-five can give you a huge advantage against Ashiok, Nightmare Weaver control decks. There are some sweet Dragon plays in this current Standard. Have you ever tried this? You get to 1) kill the opponent’s Dragonlord Ojutai (because it gets -3/-3 from the Bile Blight you cast on your own Dragonlord Ojutai followed by the -1/-1 from Silumgar, the Drifting Death), and 2) still get to Anticipate via the Ojutai attack! HOW COOL IS THAT? The rise of Den Protector! Patrick and Michael discuss the inclusion of Den Protector in Lucas Siow’s Grand Prix Toronto-winning Abzan deck. 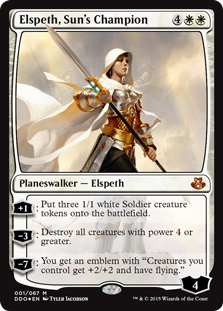 Oh, and Elspeth is back. And still great! The bulk of “I’m in Love With the Co-Co” is devoted to two Collected Company decks, Craig Wescoe’s G/W Collected Company beatdown deck and Nick Peternell’s U/G Devotion with Collected Company. 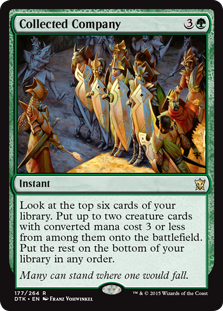 Their conclusion is that these decks are already great, but Collected Company will make for even more exciting technology as the format continues.